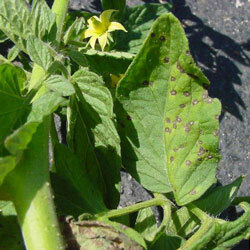 Tomato fungus may be one of many common fungi that plague tomato gardeners. Fungus can arrive on young transplants purchased from the big growers, or it can be a leftover in the soil from the previous year's problem. Fortunately, there are positive steps you can take to control and prevent tomato fungus problems. There are some differences in control methods for the many pathogens, but also good general gardening practices that are always recommended. A fungus can attack both seedlings in the greenhouse and mature plants in the garden. In seedlings a fungus can cause stunting, yellowing, and premature loss of cotyledons (seed leaves). Easily spread by splashing water. Fungus survives between seasons on infected plant debris. Extended periods of leaf wetness, high humidity, and warm temperatures exacerbate the development and spread of diseases. Don't start seeds in garden soil -- use soilless mix instead. (See Growing tomatoes from seed for more information). 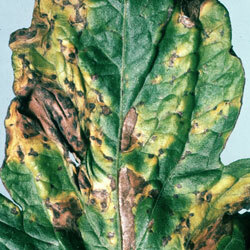 If fungal diseases are a recurring problem in your garden, consider using copper-based fungicides when fruit first develops.